In the week from April 25 to May 2, 2004, what began as a legal strike by 43,000 hospital workers in British Columbia (B.C. ), Canada nearly developed into an illegal 'general strike' by upwards of 200,000 workers against the provincial government (which funds the hospitals and the health-care system generally), and potentially involving perhaps another 100,000 to 150,000 unionized workers. This in a province of approximately 4 million people: B.C., Canada's western-most province. In the Canadian 'federal' state system, the ten provinces have various powers and responsibilities that would be held by the central national government in a non-federal state system. Responsibility for the provision of health-care is one of the most important of these functions. Since the right-wing Liberal Party government's accession to power three years previously, one of its apparent goals has been to wreak havoc on an already crisis-ridden, publicly funded, universally accessible health-care system. Another, more widely known goal of this government has been to brutally attack the share of social wealth in the province held by the working class and the marginalized, and at the same time to attack the power of the trade unions (which had been supported by the previous New Democratic Party government). One of the first things the new government did was to tear up previously negotiated, binding contracts between both nurses (actually, the B.C. Nurses Union) and hospital and other health-care workers (actually, the Hospital Employees Union (HEU)) and their government-funded employers. These were replaced by new, government-dictated contracts, which contained significant concessions for those employees concerned, concessions especially in the area of job security. This proved telling of the government's plans: to permanently eliminate thousands of health-care workers' jobs in B.C. In fact, the real plan was to radically lower the labour costs of the health-care system generally and to bring in private delivery of various 'peripheral' services in the health-care system, such as 'housekeeping' or cleaning, landscaping, and food services in order to facilitate this reduction. In the process, in the guise of "fighting rising health-care costs" so as to prevent taxes from rising further, the health-care system is being gutted, so much so that in a few years it will be in such bad shape that there will undoubtedly be widespread public demand for the option of private (i.e. corporate) provision of health-care, right up to the establishment of fully private hospitals. The result would be a two-tier system, the degraded public one for the unprivileged masses, and a much superior one for the wealthy minority. The privatization of delivery of the above-mentioned 'peripheral' services to the health-care system has involved the mass firing of thousands of workers, and their replacement (in fewer numbers) by new workers earning between 55 and 60% of those they are replacing, along with significantly reduced benefits. In fact, the contract stipulating these severely reduced levels of remuneration was agreed to by both the new employers and a different union from the one which has until now represented the workers holding those jobs. (This 'sweetheart' deal between a well known, large union (IWA -- previously the International Woodworkers of America, now the Industrial, Wood and Allied Workers) has, needless to say, thrown the 'labour movement' in B.C into turmoil.) The result of this is thousands of workers working for new private employers and represented by a new union earning $9+ an hour doing work that previously paid $17+ an hour, and with significantly reduced benefits. All of this has been part of the Liberal government's agenda since coming to power in 2001. While the hospital workers' employers are officially known as the Health Employers Association (HEA) of B.C., in reality, this organization is a puppet of the provincial government, as the latter appoints all of the officials that comprise it, and dictates to them their general strategy for "fighting escalating expenses" as well as what the financial 'bottom line' is as far as collective agreements with their employees is concerned. In the negotiations between the HEA and the HEU preceding the strike, the HEA refused to retreat from its demand for a general 15% wage reduction for all HEU members and for no limit on the number of jobs to be privatized. Naturally, the HEU membership let the union's leadership know in no uncertain terms that they would have nothing to do with any such contract. So, when the legally acceptable time for strike action arose, there was no agreement in the offing, making strike action inevitable. The union leadership knew that the membership were ready for an all-out fight against the government, so the call was for a full-scale strike, with only "essential" staffing levels (as agreed upon by the HEU and HEA) maintained. The strike began on Sunday, April 25, and ran for four days legally, before the provincial government passed legislation making it illegal. The legislation also unilaterally imposed a contract on the hospital workers which was even more draconian than the HEA's 'final offer' to the HEU, as it not only forced on them the same 15% across the board wage cut and no limits on outsourcing jobs to private employers. This legislation - not the criminalizing of the strike, but the terms of the contract - was widely condemned by the mass media in B.C. as either a "serious miscalculation" or "sheer political stupidity"; the reason being that it sent a bolt of anger through much of the working class and certainly the whole of the 'labour movement' in the province. In effect, the legislation galvanized large numbers of workers into a mood of not only mass anger, but also into a mood to fight back, to engage in solidarity action with the embattled health care workers. Suddenly 'public opinion' swung sharply in favour of the workers, and against the government. In response to the government's "back-to-work" legislation and concomitant imposition of an intolerable contract, the HEU leadership chose to defy the legislation, risking both criminal charges for contempt of court and potential fines (as have occurred in previous strikes legislated to an end). It can certainly be argued, however, that the HEU leadership chose this 'radical' option only in order to maintain its control over the strike, by maintaining its credibility with the general membership of the union, who were obviously in no mood to end the strike. The HEU chose to rename the strike a "protest" and the picket lines became "protest lines". HEU spokesman Chris Allnut, addressing a strikers' rally at Vancouver General Hospital was quoted as saying "You are to respect the protest lines until we decide that you should go back to work" (Vancouver Sun, April 30, 2004, p. A1); needless to say, the "we" here referred to the HEU leadership. It was in this context that the B.C. Federation of Labour (the umbrella group comprising most of the major trade unions in the province) came up with a plan to escalate the hospital workers' strike to a mass strike involving workers in a myriad of different sectors of the economy. The day after the legislation, as many as 20,000 public sector workers belonging to the Canadian Union of Public Employees (CUPE) walked off the job and picketed their workplaces, affecting a range of public services, including municipal halls, libraries, schools, recreation facilities, garbage services, airports, water treatment plants, public works yards, and, in one city, bus service. As well, at least 800 B.C. Hydro (electricity) workers across the province staged a wildcat strike in solidarity with the hospital workers; in fact, the wildcat began on Thursday when a number of Hydro workers at dams in northern B.C. got the ball rolling. The B.C. F.L. 's 'action plan', which was conveniently leaked to the media, described how the escalation of job action would develop to most all public sector workers, as well as significant numbers of workers in the wood and paper products industries, and tourism (hotels and cruise ship facilities). The leaked document outlining this plan of escalating strike action was published in the Vancouver Sun newspaper on Saturday, May 1 - May Day. Obviously the plan was to scare the government into backing off and killing the legislation passed on Thursday. But the plan was a miscalculation, as the government was hell bent on seeing its agenda through to its conclusion come hell or high water. 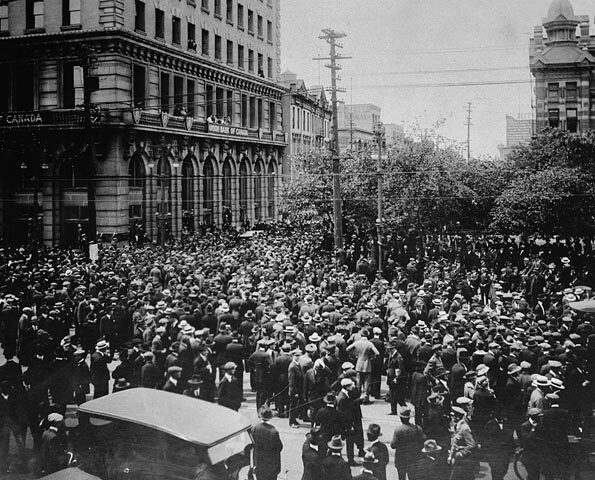 Instead, news of this plan of action for the 'labour movement' emboldened thousands of rank and file workers, who genuinely believed that their union leaders were going to lead a mass, 'general' strike in a no-holds barred showdown with the provincial government, something many of them had been looking forward to for a long time. Here was the perfect opportunity for it, as 'public opinion' was solidly on 'our' side. Saturday's May Day parade and rally in Vancouver was the largest in decades, as upwards of 10,000 people joined in, even though the BCFL steered the events clear of focusing on the hospital workers strike or their own 'action plan' for mass strike for the coming week. Rumours circulated at the rally amongst certain militant union members that the BCFL leadership was looking to quash the strike by setting up secret 'closed door' meetings with the government. The rumours proved fatefully true, as late Sunday news began to appear that the HEU, with the help of the BCFL leadership, had reached a deal with the government to end the strike. And when workers woke up Monday morning looking forward to a week (or more) of militant industrial action and political protest against the government, there was shock and disgust felt just as widely and just as deeply as their had been anger on Thursday and Friday. Only this time the object of that disgust was not the government, but the union leadership, which had signed a deal giving the government everything it had passed in its "back-to-work" legislation, except for one small concession: the 15% wage cut would not be retroactive to April 1, but would rather take effect May 1, the day before what came quickly to be known as "Black Sunday". This 'betrayal' by the union bosses was so blatant that it probably did more to disillusion workers about unions than anything else that has happened in B.C. for a long, long time. (I use the word "betrayal" in "scare quotes" because only someone who was once your ally in a fight can betray you, whereas the historical evidence clearly establishes that, when the stakes are sufficiently high, the unions and their functionaries - the ones who manage the unions - are not allies of the rank and file membership.) Not only were hospital workers given a deal by their union leaders virtually identical with the one the government forced on them by way of legislation, but the union membership affected by the deal were not even offered the opportunity to vote on this 'agreement'. While there apparently was sporadic unwillingness to return to work on Monday by some HEU and CUPE members, this writer is unaware of any self-organized wildcat actions. Apparently the shock workers felt was stronger than the anger, as there was a surprising lack of resistance to the union-government screwing over they had endured. However, a group of a few dozen HEU members did stage an ongoing protest outside HEU headquarters for the following week. Further, a grassroots-organized protest against the union's 'betrayal' was held on the following Saturday, where several hundred angry hospital workers and their supporters marched and spoke out against their 'leaders' in the HEU and BCFL. This writer attended that rally and distributed the following leaflet (slightly modified).